Under the patronage of His Highness Sheikh Humaid Bin Rashid Al Nuaimi, Member of the Supreme Council, UAE and Ruler of Ajman, Gulf Medical University (GMU) honored the achievements of 177 graduates at the 15th Convocation Ceremony held on Monday, 26th November 2018, at the Emirates Hospitality Centre, Al Jurf, Ajman. Congratulating the graduates on their achievement, H.H. Sheikh Humaid Bin Rashid Al Nuaimi Member of the Supreme Council, UAE and Ruler of Ajman urged them to continue their specialized studies and excel in their careers, and advised them to utilize the knowledge to help the society and the nation. Addressing the Emirati graduates, His Highness said that they are a source of honor to the country. H.H. Sheikh Humaid Bin Rashid Al Nuaimi presented the graduation certificates to a total of 177 graduates of the University this year; 58 of Bachelor of Medicine and Bachelor of Surgery (MBBS), 22 of Bachelor of Physiotherapy (BPT), 27 of Doctor of Pharmacy (PharmD), 33 of Doctor of Dental Medicine (DMD), 19 of Bachelor of Biomedical Sciences (BBMS), 5 of Bachelor of Science – Medical Laboratory Sciences (B.Sc. MLS), 2 of Bachelor of Science – Medical Imaging Sciences (B.Sc. MIS), 4 of Bachelor of Health Science – Anesthesia and Surgical Technology (BHS-AST), 4 of Bachelor of Science in Nursing (BSN) and 3 of Master in Toxicology (M.Tox). The outgoing students belong to 37 different nationalities: UAE (9), GCC (8), other Arab nations (41), Asia (58), Africa (42) and others (19 – including students from USA, UK, Australia, Canada, Dominica, Hungary, Ireland and Russia). Dr. Thumbay Moideen also thanked H.H. Sheikh Humaid Bin Rashid Al Nuaimi for the government’s continuous support to the institution and assured that GMU was on track to emerge as a leading full-fledged and research-based university in the region. Congratulating the graduates, he assured them of GMU’s support always. The Chancellor of GMU, Prof. Hossam Hamdy said that the number of colleges under GMU has reached 6 and the number of the undergraduate and the postgraduate programs has increased from 15 to 25. 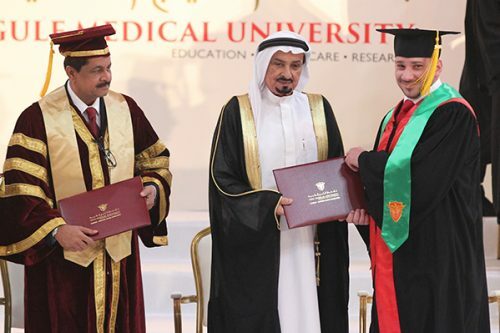 He added that GMU established for the first time in a private university an integrated system of healthcare and academia thus improving the level of health services, education and scientific research. “The Institute of Precision Medicine leads the scientific research. We are proud that a research has been accepted in nature in collaboration with France. During this year, the University signed and activated more than ten international agreements with major international universities such as the University of Arizona, Virginia Commonwealth University, Wisconsin Medical University, St. Joseph University in the United States, German Heidelberg University, Tokyo University, research institutes in France such as the Gustave Rossi Cancer Research Institute and the University of Paris and its hospitals and research centers,” he added. To the graduates, Prof. Hossam Hamdy stressed the importance of empathy, altruism, conscience, courage, teamwork and fear of God as the values that should guide them throughout their careers. Established in 1998, GMU was the first university in the region to accept students of both genders and of all nationalities in all its departments. The University focuses on three main fields: medical education, healthcare, and research. GMU is one of the most popular medical academic establishments in the Gulf region, with advanced infrastructure and facilities. GMU has been ranked among the ‘Top 50 Universities in the Middle East’ and is also listed among ‘10 Best Value Institutes in the UAE 2018’. It won the Gold Award at the prestigious Sheikh Khalifa Excellence Awards, 2018. It has students from 80 nationalities and faculty/staff from over 25 countries. GMU organizes international and regional conferences and seminars in all medical fields.